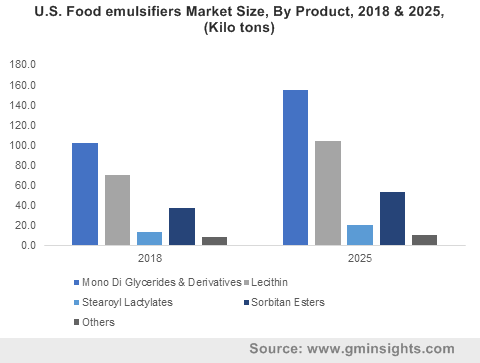 Food Emulsifiers Market size was over USD 2.5 billion in 2018 and industry expects demand of above 1.3 Million tons by 2025. Rise in processed foods consumption owing to easy availability through well-developed retail channels will foster industry growth. Food Emulsifiers provides smoothness and helps to stabilize emulsions in food & beverage production processes. It helps to improve their quality and functions as an emulsifying agent. It is also utilized for manufacturing instant noodles, macaroni, fresh noodles, and spaghetti offers elasticity as it provides elasticity and smoothness to these products. Growing demand of ready to make and instant food stuff will have positive impact on instant noodles market thus fostering global market growth. Rapidly growing urbanization have escalated demand for processed food products. The product helps to improve the texture, appearance, and taste of processed foods. These properties make it suitable for its utilization in manufacturing instant mashed potatoes, cheese, canned and carbonated beverages which will enhance the market size. Food emulsifier has its applications in manufacturing alcoholic beverages. It is added to beer in brewing industry for extending its shelf life. Global alcoholic beverage industry may surpass USD 1,680 billion by 2025. This will promote emulsifiers utilization in breweries, thus promoting industry growth. Lecithin which is extracted from natural sources including egg yolk and soy is extensively utilized as an emulsifying agent in bakery products, salad dressings and ice creams. Global lecithin market is expected to grow at 5% by 2024. Growing demand for natural products will foster lecithin utilization in nutrition industry which may drive emulsifying agent market growth. Regulations pertaining to acceptable levels of emulsifiers in food & beverage industry by regulatory commissions including FDA will favour product demand due to its safe and non-toxic nature. These factors make them suitable for manufacturing several nutrition products including baked goods, sauces, noodles, coffee, and salad dressings, thus driving emulsifying agent industry growth. Vegetable oils, Soy and eggs are key raw material used in commercial production of natural emulsifies. Raw material price fluctuations mainly for manufacturing natural emulsifying agent owing to season dependency on yield for may hamper industry profitability which may affect food emulsifier market price trends. Research studies depicts that chemically synthesized emulsifiers may cause problems including inflammatory bowel disease and obesity as it interferes with microbes present in human’s gut which may act as another retraining factor. However, rising R&D expenditure to manufacture bio-based emulsifiers will favour product demand. Stearoyl Lactylates based food emulsifiers market size may exceed USD 320 million up to 2025. It is extensively utilized for manufacturing ice creams owing to its emulsifying and stabilizing effects which will favour industry growth. Rising demand for different flavoured ice creams due to changing consumer preference will propel ice cream production which will drive industry growth. Sorbitan esters-based food emulsifiers market size may register steady gains over 4.5% at up to 2025. It functions as an emulsifying agent for manufacturing cream in dairy industry. It acts as an interface between conflicting constituents including oil and water. Rising demand for flavoured creams in making apple tart and nut puddings will boost product demand. Food emulsifier industry demand from bakery & confectionary application is expected to surpass USD 2,550 million at the end of 2025. It provides softness, mechanical force resistance and emulsifying properties in baked goods. Global bakery goods market is estimated to grow at 2.5% during the estimated period. Emulsifiers are utilized for manufacturing breads, cakes, toffees, caramel, and biscuits which will propel industry growth. Food Emulsifier market from food & nutrition application may observe significant gains over 4.5% by 2025. The product is utilized for making soups, gravies, and ready to eat nutrition products owing to its fat dispersion and shelf life extending properties. Rising disposable income levels and working-class people will foster demand for convenience nutrition products will stimulate industry growth. Food emulsifier market from beverages application is expected to surpass USD 550 million in the estimated time span. It maintains stable dispersion of oil droplets in aqueous phase and is utilized for manufacturing soft drinks. Rising demand for low-calorie soft drinks due to growing health awareness will drive beverage industry thus boosting emulsifying agent market growth. North America led by Canada and U.S. market is predicted to grow up to 5.5% up to 2025. It eliminates friction between powdered milk, sugar, and cocoa butter, thus promoting its use in manufacturing several chocolates including dark and milk chocolates. Presence of many international chocolate brands mainly in U.S. and Canada will foster chocolate industry growth, thus driving product demand. 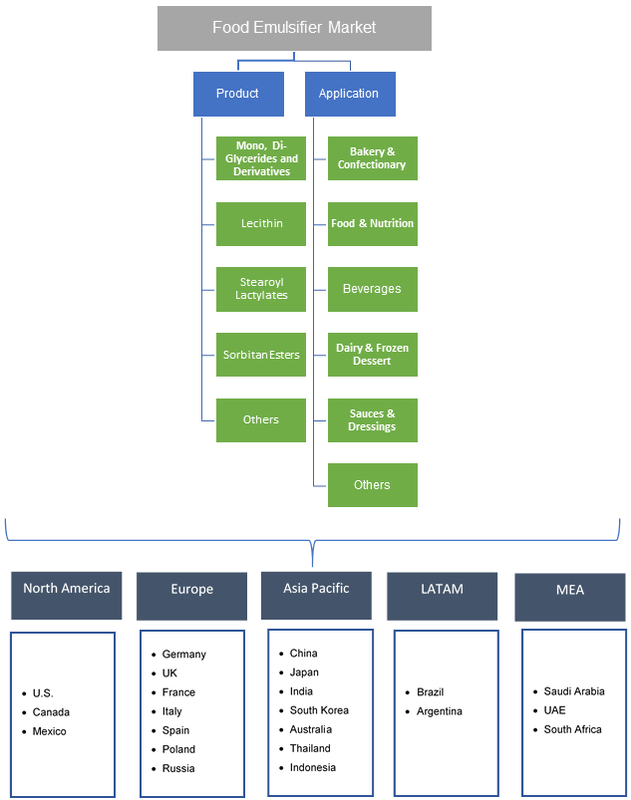 Asia Pacific driven by India, Japan, China and South Korea food emulsifier market size may exceed USD 1,100 million by 2025. Emulsifying agents represses foaming and stimulates emulsification for manufacturing tofu. Meat is being increasingly substituted with tofu owing to its cholesterol free and gluten free properties. Rising demand of vegan diets in China and Japan will escalate tofu manufacturing which will enhance regional product demand. Brazil market may show significant gains over 4.5% by 2025. The product assists to ease coffee creamer dispersion and enhances whitening properties. Rising cultural importance of coffee in the country will increase product demand, thus driving regional industry growth. Global food emulsifiers market share is competitive and highly fragmented. Major players operating in the market including Palsgaard, Cargill, Mitsubishi Chemical Corporation, Riken Vitamin, and Lonza Group. Companies are involved in strategic alliances including mergers & acquisitions, joint ventures, partnership to implement innovative technologies with growth in production capacity to cater rising product demand. In January 2017, Palsgaard has acquired a major stake in Brazilian Ingredients Company Candon Aditivos para Alimentos which is supplier of bakery emulsifiers. This acquisition will help the company to increase its product reach and will have a positive impact industry growth. Food emulsifying agent besides emulsification has several other properties which are used for manufacturing different nutrition products. It modifies oil crystal and inhibits water spattering during cooking. It is also utilized to provide smooth texture and maintain shape of ice creams. It also helps in extending product shelf life. Changing lifestyles & increasing consumption of convenience and packed food owing to rising urbanization and disposable incomes of consumers will foster industry growth.